After waiting so long for spring and watching the rhubarb coming up so slowly, they are ready! Summer is here and we are up to our elbows in Rhubarb. 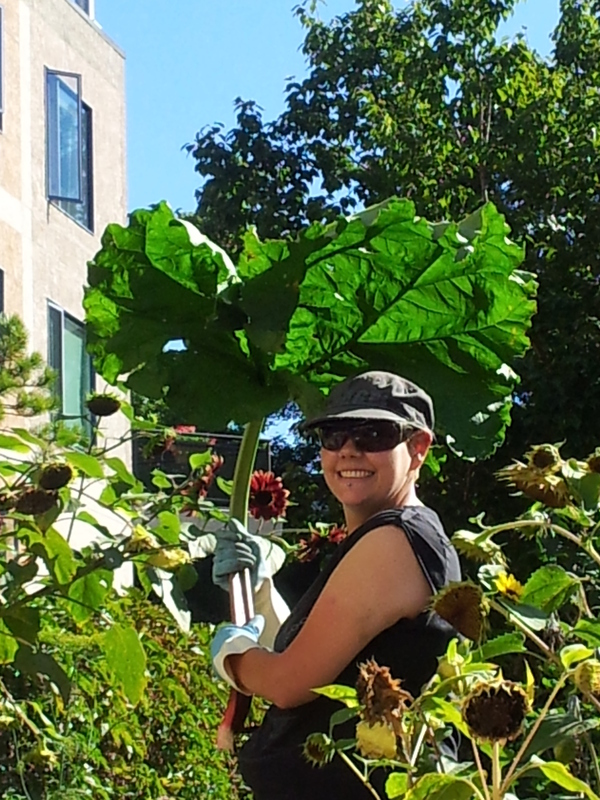 This past week we received about 150 kg - we picked some and some were dropped off by homeowners. Wow!!! It has taken most of 2 days just to wash it, chop it, juice it and tuck it away. So what will be coming out of the kitchen? Firstly we made lots of Strawberry Rhubarb Jam followed by Hot Pepper Rhubarb Spread. This will satisfy both the sweet and savoury side of the market table. Then Spiced Rhubarb Jam and Blueberry Rhubarb Jam is next on the list, to soon be followed by Mango Orange Rhubarb Jam. The raspberries will be coming next and we will be happy to start producing Raspberry Rhubarb Jam and Raspberry Pear Rhubarb Jam. Wow the kitchen smells like summer. These wonderful jars are filled with rhubarb juice. It is so ruby red in the spring that it almost looks like it should be strawberry juice. We use this to make Lemon Pepper and Gin condiment and Sweet Chili Tri Sauce so these sauces are soon going to be pouring out and ready for the market tables. Finally comes the ketchup. We had just about used up all our reserves, but rest assured, we now have lots of raw material to keep our ketchup fans well supplied. Keep the rhubarb coming - I don't think we can have too much. And if we do have more than we can use, we will find people who want to use it. It will not go to waste. As we are starting into our 4th year , we would like thank everyone who has supported Fruits of Sherbrooke over the past and welcome you as we continue to grow. We started in our neighbourhood of Sherbrooke with the mission of using fruit that was falling to the ground as we believed it was the right thing to do, it was free and we wanted to show that good things could be made with this abandoned fruit. We walked from yard to yard and as you can see from this photo, Christina brought her grandchildren to help and the bounty was hauled home in the wagon. We proudly had a little footprint on our labels at that time as we claimed to pick within walking distance of our community league. It was an environmental effort and we made jams and applesauce as a way to use the fruit. Over the second year, we received calls from farther afield to come and pick their fruit. We were appreciative of the offering, so we went, picked and tried to leave homeowners a jar of jam in thanks. It was manageable and we were having fun. We were not making money yet but assumed it was the cost of starting up. Year three was 2013 and it all expanded. We were making lots more product, selling in more markets and thus had to gather more of this "free" fruit. At the same time we were busy making sure that fruit, excess to our needs, was given to other small charities, non-profits, community kitchens, group homes, university food banks, schools and individuals that would use it. In the fall of 2013 we diverted over 8,000 kg apples to these places plus other produce that came our way. We partner with Winnifred Stewart Association and Chrysallis to offer job experience opportunities, we offer entry level work experience to people who volunteer in the kitchen or help with labeling. 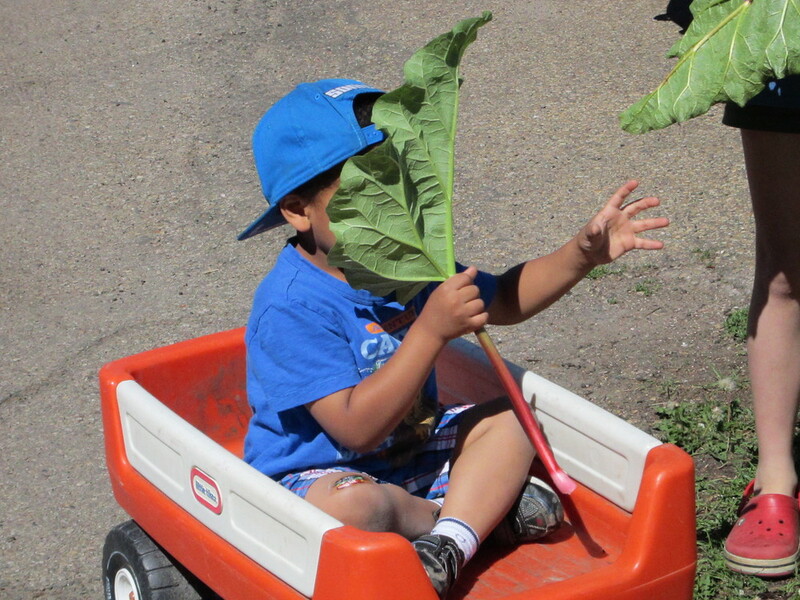 As a caring, grass-roots organization, we offer a flexible work setting that allows people with children or health issues to volunteer with us. We do offer reimbursement for travel and expenses, so it is a good starting place for many. In addition we have been planning the launch of our Cherry Stone Soup program in 2014, and this will offer preserving courses to low income participants in the city. Christina has also been busy creating networks with local animal farms asking them to pick up apples that are not suitable for human consumption and bring them to their farm animals. These are a lot of initiatives that meet our mission of having all the local abundance of fruit used for food. In the winter of 2013 - 2014 we have been meeting with consultants from Alberta Agriculture and one of our challenges was to actually look at the cost of our 'free' fruit. As mentioned above, we figured it was free and happily drove around picking, picking up and bringing it back to our kitchen. But as we worked it out, we found that it costs more than buying it from the store. WOW! what a surprise that was! We have no economy of scale. Take rhubarb for example. 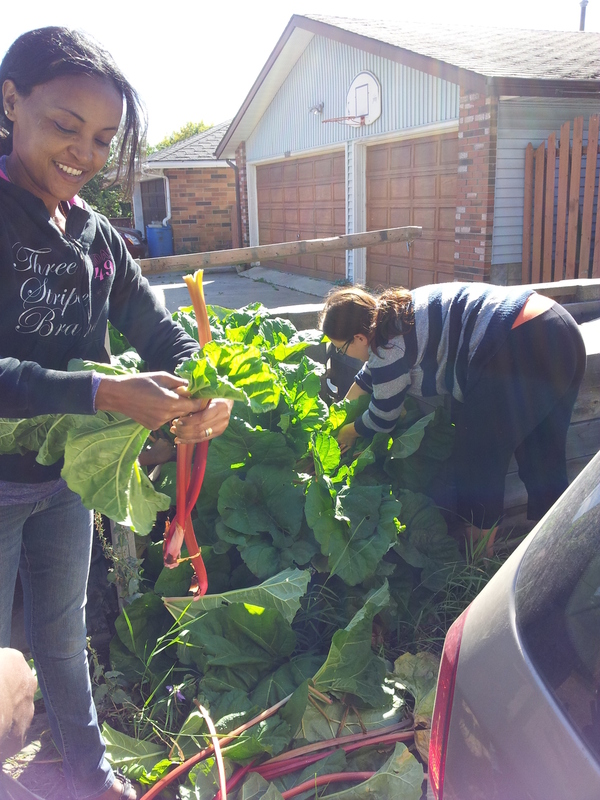 We have patches of rhubarb all around the city and we try to pick every 4 weeks. It is a lot of driving throughout the summer gathering a few bags here and there. The fantasy of having a field of rhubarb is often in our minds. Then we have to clean it up, chop it finely (nobody likes to find long fibres in their jam) and compost the leaves and trimmings. This work is all done by hand. As we gather more than we can process during the summer we have a number of freezers spread around this part of the city in people's basements, garages and a church basement. So we have to ferry the bounty into storage for winter's use. At the same time, we make lots and lots of rhubarb juice and store it in jars. This juice is added when we need liquid in our rhubarb jams and is also the base for a lot of condiments - Lemon Pepper Gin Jelly and Sweet Chili Tri Sauce for example. You can only begin to guess how much time is spent picking local raspberries and saskatoons, climbing up ladders into cherry, pear, and apple trees, reaching around pokey branches, moving the ladders time and again and then driving back to sort, wash, chop and juice each of these fruits for use. All of this work is done before we even start to make products. We have learned that using locally rescued fruit is a good environmental choice but not a cheap choice. Then after doing all this work, we have been leaving a jar of jam in thanks. The accountants in our world, shake their heads, not only does it cost a lot of time and energy to 'rescue', then we have been adding more to the cost of the fruit collected by giving away jam! It just goes to show that we are kind-hearted environmentalists and not money smart - so far. Has this deterred us? No. We know we are right in using good local fruit that would otherwise be abandoned. We know we make good product with a green footprint. We use our own fruit juice whenever liquid is required. Every product is 60% - 100% rescued fruit. As the chief cook, I am always thinking of new ways to use our rescued fruit. We have 6 basic local fruits that we can count on rescuing each year - rhubarb, raspberries, sour cherries, pears, apples and crab apples (in abundance). There are always other treasures that come along such as saskatoons, wild blueberries, herbs and even pumpkins in the fall plus the BC fruits we rescue from the Farmer's Market. However, our staples are rhubarb and apples. We found out pretty quickly that if we want to sell jams and condiments with these abundant fruits I have to find innovative ways to put them together. Rhubarb is a wonderful fruit/vegetable as it is versatile, partners well with other fruits and provides a good carrier for strong flavours. At present we probably have about 30 different recipes with rhubarb in them one way or the other. It is also the first ingredient I consider when I want to create something new - especially as it is still so abundant. I had been thinking of making a variation of the Thai Sweet Chili sauce but I needed a couple of things to come together. On one of our many rainy days in late June, I visited a local Mexican store and as there was nobody else there, I was able to ask lots of questions and was introduced to some new (to me) chili peppers. I finally had the flavours I wanted. So back in the kitchen we juiced some rhubarb (what else? ), soaked some of the new chili peppers and pulled together some other potential ingredients and started to create. These days of creation are the best!!! The process is to put together a few possible recipes, taste them, add something to tweak it one way or another, taste again and then tweak and taste. As I now have some wonderful assistants from Ethiopia, they come with different food experience and knowledge, so we can sometimes be rather far apart at the start. But with friendly competition and lots of laughter, we finally move towards perfection. The amount of heat is still open to discussion but we did agree to a medium heat that will give a wonderful tingle at the end, but is still acceptable to a typical Canadian palette. We call it Sweet Chili Tri Sauce as there are 3 chilis in it. The sauce itself has a lovely full flavour before you get the heat. There is the fruity body that is provided by rhubarb juice and a light smokiness given by one of the peppers. Then we added a light touch of some other notes of flavour to fill the mouth before the chili peppers start their demand for attention. I think as a team of cooks, we did a really great job with this one!! When we took it to the market a couple of weeks ago to see what our customers thought - it was an instant success! Ann Kusiak told me last week that it is a favourite in her family already, (alongside the Chipotle Rhubarb Ketchup) and when she told me how she used it I asked for her recipe. Very kindly she shared it and I am forwarding it with this post. Enjoy the recipe but before you get too deeply into the dipping, take a taste of the sauce by itself and see what you think. Share your comments and recipes as well. Green Onion Pancakes with Fruits of Sherbrooke Sweet Chili Tri Sauce. Anne said this recipe is from the 1992 Moosewood Cookbook. Combine flour and salt (if using) then mix in the onions. Add water and mix until it forms a dough ball. Divide dough into 6 pieces and on a floured surface, roll out or press with fingers into a 1/8” thick circle. In a heavy fry pan, heat oil over medium heat and pan fry each pancake for 3 – 5 minutes until golden. Alternately you can brush pancakes lightly with oil and bake in a pre-heated 350 F oven for 10 – 15 minutes, until cooked through. Serve warm with Sweet Chili Tri Sauce. The siren call of spring brings the rhubarb popping up out of the ground as the (almost) first food of spring! Christina and her crew of volunteer pickers have been out harvesting already and in just under 3 weeks they have brought in over 100 Kg. That has disappeared into the cooking pots and then into jam jars ready for the market. Here is a list of the wonderful things we have already made with rhubarb (and there are a few more in the test stages). ** Apple, Plum, Rhubarb with plums and apples saved since last summer's bounty ** Blackberry Rhubarba wonderful dark jam full of summer warmth ** Blueberry Rhubarb is a lovely dark colour and the rhubarb adds zest to this wonderful fruit ** Grapefruit Rhubarb is a wonderful combination of these 2 tart fruits that give a marmalade flavoured jam with a soft texture ** Mango Orange Rhubarb has the mellow mango fullness balanced with the zip of rhubarb and orange ** Pineapple Rhubarb is an old fashioned jam that used to be made by many grandmothers ** Raspberry Rhubarb and ** Raspberry Pear Rhubarb. Last year we had taste tests to see which was the favourite and since it was almost a tie, we have again made both jams with raspberries donated to us this past winter ** Sassy Barb with Orange uses local saskatoons and rhubarb and unites them with a hint of orange ** Spiced Rhubarb fills your mouth with a burst of fragrant spices ** Strawberry Rhubarb the perennial favourite and it's adult cousin ** Strawberry Rhubarb with Sambucaliqueur($1 more) adds a hint of black licorice to the strawberries ** Vanilla Rhubarb ($1 more) is made with whole vanilla beans so it is a delicate flavourful jam perfect for an afternoon tea with scones and crumpets. ** Chipotle Rhubarb Ketchup is our best seller and we have made lots for the Bar B Q season ** Citrus Ginger Sauce is a lighter sauce without tomato that goes well with pork, chicken and fish ** Hot Pepper Rhubarb Condiment is like hot pepper jellies but since we use full fruit it spreads easily and does not melt and slide off your finished food. It is growing to be one of our top 10 sellers! ** Lemon, Pepper and Gin Condiment ($1 more) is made of rhubarb juice with fresh lemon and freshly ground black pepper finished with Gin. ** Rhubarb Chutneyis full of spice, vinegar and chunks of fruit. ** Rosemary Jelly is a clear jelly that fits well in the sweet side to use on toast but also accompanies lamb and chicken ** Sweet Chili Tri Sauce is our newest product. It is similar to Thai sauce but we believe it has a stronger opening flavour that ends with the satisfying warmth of it's 3 types of chili peppers. So this is why we call it Rhubarb Rhapsody - so many flavours and combinations and all from the humble rhubarb plant. We can also ship to customers in Canada so give us a call at 780-244-0129 to find out more. Come out to the local Farmer's Markets listed below and see what we are sampling each week. As we have such a large selection of product, different items are featured each week, so over the summer you will be able to taste everything. By coming out to the markets, you can also purchase items that we are putting out for a test or items that come in limited supply. For your information we work hard to be environmentally responsible and our tasting spoons are made of potato starch (non GMO) and thus are compostable. In the kitchen we recycle what we can and compost all of our kitchen scraps before using the garbage bin. Wednesday 4:30 – 7:30 pm: South West Edmonton Farmers Market at Terwillegar Community Recreation Centre - 2051 Leger Road. Sunday: 10:00 am – 3:00 pm Callingwood Farmer’s Market at 69 Ave and 178 Street. Sunday: 10:00 am – 2:00 pm Petroleum Club Market at 11110 - 108 Street. This week we are featuring 2 great jams to go in these muffins. Strawberry Rhubarb Jam has over 55% rescued fruit and it is a perennial favourite for many. We do buy the strawberries for even though they do grow here, nobody gives them away!! Use it on toast or ice cream sundaes or consider adding it to these easy muffins that travel easily. I have attached a photo of our older label but that jar is surrounded by the fruit you will find inside. Gingered Saskatoon and Apple Jam is made with local saskatoons and our local apples with a lovely zing of ginger to add a sparkling note. It is great on toast but consider this jam as a topper to ice cream and cheesecake, or mixed into your morning yogurt. When you taste our jams you will find the fruit flavour fills your mouth. This is because it is made with 100% fruit with no fillers or added juices. On the occasions when we need moisture in the pot to start cooking our jams, we only add juice that we made ourselves from the bounty of the summer. These little treats are great for snacks, lunch boxes or popping in your hand as you run out the door as the jam is inside and doesn’t mush around in the packaging. They have some whole wheat flour and you can pump up the fibre and nutrition by adding 2 Tablespoons of ground flax seeds, bran or seeds and nuts of your choice. 1. Preheat oven to 375 degrees. Prepare 12 regular muffin tins by lightly greasing. 2. In a large bowl combine all dry ingredients plus the seeds, nuts and extra grains. 3. In a smaller bowl beat the egg (and honey if you are using it instead of sugar) and oil until smooth, then mix in yogurt and vanilla. When thoroughly combined pour over dry ingredients and stir gently until combined. 4. Fill muffin cup to 2/3 full and scoop batter in cup with back of spoon to leave a depression in the centre. Add a generous teaspoon of jam to the depression and then top with the remaining batter. 5. Bake for about 12 minutes. Test if needed by putting toothpick down the side to avoid the jam. 6. Remove from oven and let them cool in the pan for 10 minutes before removing to cool on a rack. VARIATIONS: I love doing this part so hopefully you will always find it after our recipes.